If you are missing teeth, you know the discomfort it can cause. Missing teeth can cause social discomfort by making you feel less confident, and making it harder in some cases for those with missing teeth to speak well. They can cause other forms of discomfort too, from not being able to eat the foods you love, or make you feel embarrassed by the gap in your smile. We understand the emotional distress and physical hardship that having missing teeth can cause because we have seen patients and their families who have been effected by this type of struggle. At Pryor Family Dental we offer options to help treat those with missing teeth, so that they can get back to eating the foods they love, and laugh and smile with confidence. One of the treatments we offer to our patients with missing teeth is a dental device called a dental bridge. Dental bridges can be used to successfully bridge the gap left behind by missing teeth and restore beauty and functionality to your smile. A dental bridge is a dental device that looks like your natural teeth. On either side of a dental bridge, the bridge is anchored by dental crowns, providing strength, beauty, and functionality. Dental bridges are custom designed for the patient that requests them. This means that when you get a dental bridge, it will be made to fit your mouth, and your situation. When one of our patients gets a dental bridge, we want to make sure that it fits well, functions well, and looks great, and this can be accomplished with bridge designed with you in mind. Getting a dental bridge can help reduce wear and tear on your other teeth. This is because when you lose teeth, it means your remaining teeth have to compensate for the ones you’ve lost. When you have a dental bridge, you can use it like your natural teeth, and decrease the wear on the teeth around it. If you have lost a teeth, dental bridges and crowns can be a wonderful option to help you get your smile back. 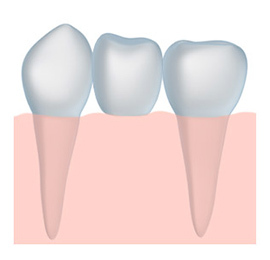 Have any questions about dental bridges and crowns? Please contact us today!